Speed is a major tunr on for Spanish mackerel...the faster the lure, the better. THERE'S nothing more exciting in the heady world of saltwater sportfishing than a surface bite. From bream to billfish, any time that fish you’re chasing eats off the top, angler excitement levels will always redline. Throw in a fish that will mow down a surface lure with explosive speed and ferocity, and you’ve got a situation that forces sounds to erupt from your throat that you weren’t even aware you could produce. 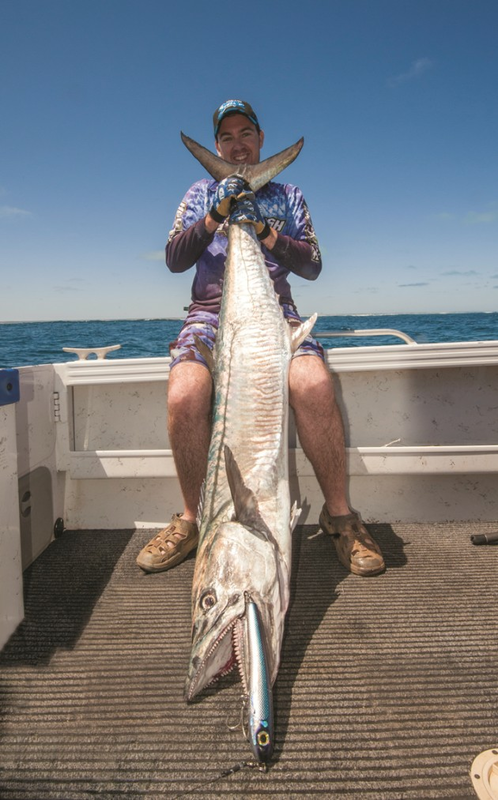 The reason for this potentially stems from the sort of surface lures Aussie anglers have - up until recently – predominantly thrown around Spanish mack territory to catch other species like GTs, queenies, coral trout and so on. 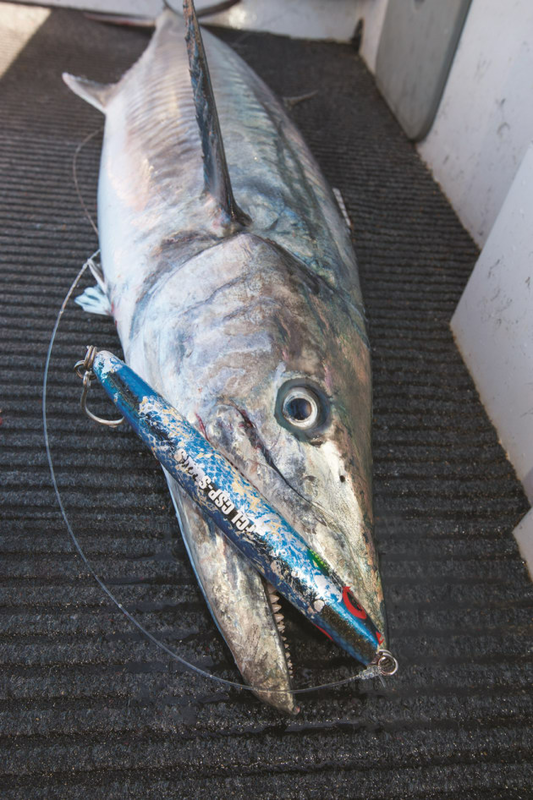 For the most part, cup-faced poppers have been the weapon of choice for this fishing, and the need to work these high displacement lures relatively slowly largely takes mackies out of the equation.Spanish mackerel are just this kind of fish. Fearsome, insanely fast attacks are how these fish make their living, and most of the time their devastating, hit and run strikes on their unfortunate baitfish prey naturally take place at or very near the surface. Surprising then that mackies have never really been a popular surface luring target. As anyone who has spent some time trolling lures for Spaniards will know, speed is a major turn on for these fish. Sometimes the faster the lure moves, the better the spannies like it. So when stickbait style surface lures that are best worked a little quicker than poppers really started to come into vogue a few years back, having a surface lure mack attack became much more common. This trend was very much mirrored in my own fishing. 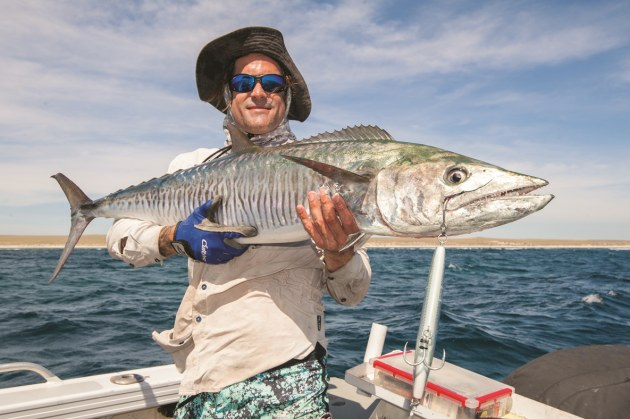 The more we threw modern surface stickbaits for GTs, the more mackerel we caught until it became face-slappingly clear that this entertaining happenstance was way more than just a by-catch event. Specifically targeting spannie macks on surface stickies has since become a go-to technique for us. It doesn’t take much insight to understand why anyone might want to throw a surface lure for Spanish macks. The strikes stickbaits can elicit from these fish can be properly insane; at least half of the time launching from the water like a Polaris missile and soaring many metres straight up into the air with your lure firmly clamped between that buzz-saw jaw. If that doesn’t get you hollerin’ it might be time to reassess life! The other major positive to this eye-popping mackerel method is that stickbaits generally attract a much larger class of spannie. In my experience, bigger stickbaits in the 20-30cm range are more effective on these fish at any size which is possibly why we’ve seen a higher incidence of big spannies climbing on, but still, hooking 20kg+ models seems to be a far more regular occurrence on stickbaits than it is on standard lure or bait trolling techniques. Setting up for spannies on stickbaits takes far fewer alterations to the standard method used for say, GTs or kingfish than you may think. The obvious inclusion is some bite protection to guard against those vicious teeth. However, from my experience, wire leader isn’t really necessary. Larger stickbaits seem to attract more attention from Spanish macks. Using these larger stickbaits that seem to attract more attention from Spanish macks, it’s actually surprisingly rare to be bitten off when running nylon or fluorocarbon leader straight to the lure. Personally, I’ve only been snipped off on a couple of occasions, and other keen heavy tackle surface luring enthusiasts I’ve talked to about this have reported the same results. If you are concerned about losing fish and lures to bite-offs – and let’s face it, large stickbaits aren’t exactly cheap – you could easily add a very short length of light single or multi-strand wire ahead of the lure as a bite leader. The downside to this though is that it could potentially reduce the likelihood of a mackie hitting the lure in the first place by having a negative effect on the action or natural appearance of the lure. To grab a hold in that bony, razor-sharp mackie jaw, fine gauge but strong treble hooks are the obvious rigging choice. Assist rigged single hooks work a treat too, although these must be rigged on wire as mackerel teeth will make short work of Kevlar assist cord. The lightest, finest diameter multi-strand wire (which will usually be about 90lb) is the best choice here, as single strand is more likely to kink and break. Using heat shrink tubing to finish off your wire assist rigs can also help prevent the light cable kinking or the hook catching back on it. It pays not to scrimp on terminals when rigging stickbaits for mackies as there’s a lot of pressure exerted on them during those high speed strikes and runs for which Spanish macks are so renowned. Split rings in particular need to be top quality, as these are a potential weak point during a high velocity hit and run. Both floating and sinking stickies will work well on big macks, with the sinking stickbaits sometimes delivering an advantage when the fish are holding deep or a bit shy to blast lures off the top. The key to a good spannie stickbait is that it casts really well and has an easy, side to side action at a decent retrieve rate. Another useful tip when selecting spannie stickbaits is to opt for moulded plastic versions over timber lures. When a mackie eats a lure, it’s rows of saw blade-like teeth can catch in the softer timber lures, whereas they’re lure likely to just slide across hard plastic and improve the chances of the hooks finding a hold. High quality timber lures can still be okay, so long as they have a very tough, deep resin finish that will likewise help the lure slide over those fangs. 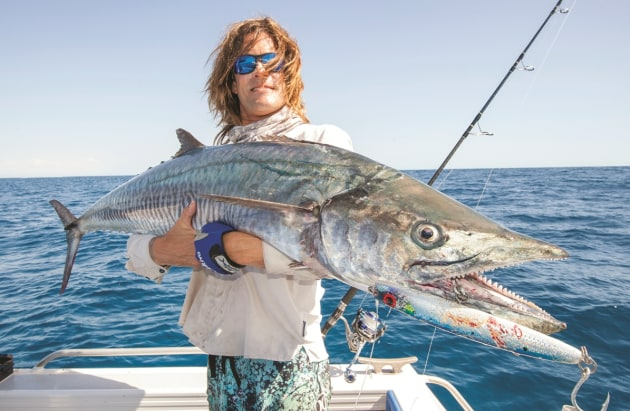 Spanish macks can really burn string once the hooks bite home, but that’s about the end of their trick list when it comes to the fight. In an ideal world, 20-30lb outfits would be absolute joy to use on even donkey sized spannies, but unfortunately in most mackerel infested parts of the country this sporty gear just isn’t practical, especially of sharks are present. Spanish mackerel burn themselves out almost completely during the fight. Being the vicious, cold blooded killers that they are, Spanish mackerel don’t need a huge amount of encouragement to eat a lure of any kind. To coax them to explode on a surface stickbait, there’s basically a couple of approaches that will get the job done ninety nice percent of the time. Speed is a major strike trigger for these fish, so simply skipping a stickbait across the surface at pace can often be all that’s needed. However, we’re not talking high speed spin here; in actual fact going too fast can limit the opportunity for the macks to attack or lead to a lot of strikes that completely miss the lure. So just a half to three quarters of your top winding pace is more than sufficient. Most of the time though, the better retrieve option is to let a good stickbait do what it does by employing a “walk the dog” retrieve. For those unfamiliar with the term, this is simply a constant wind while rhythmically pulsing the rod tip to get the stickbait sliding from side to side in an attention grabbing, wounded baitfish type action. Long casts that allow you to cover more water are essential for stickbaiting spannies, although it is advisable to stop that retrieve once the lure gets within 10 metres of the boat. The reason being that you actually don’t want a mackie exploding on the lure that close to you. Having 20+ kilos of high velocity Spanish mackerel bursting from the water right next to the boat may be exciting, but trust me, it’s not the best feeling when that head full of buzz-saw teeth is flying straight at you! As mentioned earlier, when that strike does come, there’s an important technique requirement to getting the hooks in on a spannie. Most of the time the strike from one of these fish on a surface stickbait will be at full speed to the side or even straight from below with the fish getting well and truly airborne. In either scenario, the lure simply won’t be where it was mere microseconds before which can create slack line. So try to be ready for it, and when you do get hit, avoid the instinct to strike until the line is tight. If that blink-of-an-eye hit makes the line go slack, the play is to wind into the fish as fast as you can and only then strike hard when the weight comes on. When the hooks do go in, the fireworks usually kick on in earnest. In fact, when you hook your first spannie spinning on a stickbait you’ll probably immediately find yourself wondering why the hell you wasted so many sessions trolling for them. That first run is epic! Unless it’s a real horse though, the fight is pretty much done after one or two streaking runs. For this reason, Spanish mackerel are not really a catch and release species. They burn themselves out almost completely during that high speed fight and don’t handle well. On the up side, they’re great on the grill and even better in the smoke box, so once you’ve caught enough for a feed it’s best to leave them be and head of to chase something else. This can actually be really convenient seeing as Spanish mackerel are typically most on the fang at first light when they will usually be up on top hounding any poor baitfish that have blundered into their reef edge kill zone. This makes stickbaiting for these fish a fantastic day starter, and any day that starts with 20+ kilos of out of control spannie mack detonating on a surface lure has got to be a good day!